REVIEWS – GPW ‘BACK WITH A BANG’ #THEPIESAREON! Hello and welcome everyone, once again to Graps and Claps this time travelling to Hindley for the first time this year for Grand Pro Wrestling ‘Back with a Bang’ with very much a card full of new and established stars in the land of Hindley Graps with the debut of Lucas Steel who has been making noises in NGW Wrestling and has recently been the feature of the ‘One to Watch’ part of Fighting Spirit Magazine. The trip to Hindley as ever started with the dash to Rochdale station, with me this time just missing the direct train to Hindley, so instead I had to get a train to Manchester VIctoria then one from that station to HIndley which didn’t cause much too much fuss arriving into Hindley for 6:15 pm to meet up with the rest of the gang (Ben, Chris, Geoff and Tom) in the Edington Arms which I will report about later on the going downs in the karaoke world. Only one stop for me this time in pub land which was the posh wine/cafe bar called Kore which since gaining a craft beer selection is now becoming a place to visit when going to GPW. Two drinks here were a Jester Pale Ale (4.1% £3.20 pint) and a Hophurst Brewery Cosmati Pale (4.2% £3.10 2/3rds), with the Jester Pale Ale being the standout drink – not too heavy with a smooth light taste this was a winner with my palate. Drinks done and the time reaching 7:10 pm, we made our way into the Monaco Ballroom for the night’s action and in a continuation of things from last year a packed crowd was in attendance estimated easily around the 200 marker with people standing at the back of the room and also near the bar due to seats being well taken up. Ticket prices have gone up £1 here, but for £9 entry you can’t complain much with the quality of action you are always served at these shows, one big revelation that came apparent during the afternoon was that they had finally found an oven to heat the famed ‘Hindley Pies’ up better – so for a great start to the GPW year – THE PIES WERE ON!!!! With that said, let’s get into what went down with the first match being a big grudge match that has been going on for quite a bit with ‘Magnificent Matthew Brooks’ taking on Isaiah Quinn with his House of Isaiah in tow (Nick Maguire and Jacob North). After being captured by Quinn’s group a number of months ago, Brooks finally left the clutches of the house back in November so he was free to go back singing and to entertain once again, however that could all change again with the stipulation in this match that if Brooks lost he would have to once again join the House of Isaiah which the crowd certainly didn’t want to see. However, if Brooks won Quinn would be forced into singing a duet with Brooks as per the stipulation. Early on it was Brooks who was in control hitting a Singer Splash followed by 10 punches in the corner and a high pitched song right into Quinn’s ear to deafen him, Brooks then followed up with a flying headscissor, but Quinn managed to recover to hit a back cracker to get back on top. As the bout moved on to it’s big crescendo with the referee (Fitzgerald) not looking, Brooks got hit with Quinn’s stick which resulted in a two count, thankfully for Brooks who made a fightback but found a bump in the road when he missed a big legdrop which put the ball back in Quinn’s court, but it was maybe complacency on Quinn’s part as he was caught out of nowhere with a CHEEKY ROLL UP! from Brooks who picked up the popular 3 count in a really fun opener to proceedings. As per the stipulation, Quinn had to sing a duet with Brooks – that being ‘Purple Pants’ by PRINCE, that brought fits of laughter from our section! Just as Quinn was getting into the spirit of song he attacked Brooks from behind leading into a beatdown from the House, that was until Brooks was eventually saved by JJ Webb and Stoxx (The Green Machine) to bring some sense of order. Up next was a No.1 Contenders match for the vacant British Title with two qualifiers taking place on this evening, first starting with this fatal 4-way contest with Luke Jacobs vs Kameron Solas vs Dylan Roberts vs Rio. 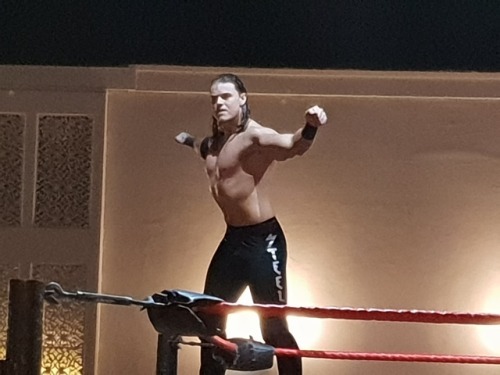 Early on it was Jacobs who was on the offence first hitting clotheslines and suplexes to everyone and looking good in the process (Jacobs certainly looks like someone with a great future with his Rugby style broadness and hard-hitting offence). 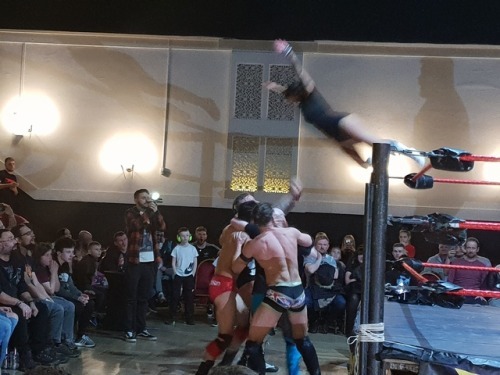 As the match moved on, we had a high crossbody by rio to Solas for two, then as Roberts (who had been on the outside for quite a while saving himself for later in the match) and Solas were on the floor, they were hit with a big dive by rio and luke to floor them instantly. Back in the ring, Kameron Solas who was once again impressing hit a slam on Luke to Rio’s back leaving them crumpled in a heap, but Rio was able to recover from this as later in the match he hit the big tower of doom spot to everyone to leave a mass of bodies in the ring. Home stretch now we had a missed Sky Twister Press by Solas and also Jacobs got taken out leaving Dylan Roberts to lock in the Arm Clutch to tap Rio out, in what looked sadly like a miscommunication between the ref and rio, as Rio took ages to tap out, which was a shame because it was an alright match. Next up was the singles debut for two of the up and coming stars of the scene with Ethan Allen who has been making waves in Futureshock as part of the Young Guns with Luke Jacobs taking on ‘The Standout’ Lucas Steel who instantly as he walked through the curtain got the ‘Wow’ reaction from the crowd in attendance which is a great base for him meaning the crowd thought he looked a threat instantly. Ethan early in this match tried to knock the big fella down to size with strikes and kicks but he was waffled with a hard clothesline and a big elbow by Lucas for a two count, When Ethan did get Steel to 1 knee he hit more kicks followed by a Roundhouse and then a DDT for 2 to daze Steel. 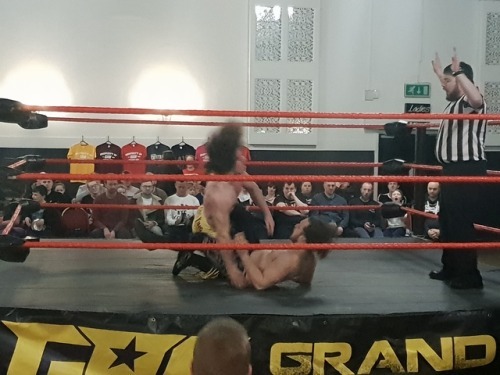 As the match reached its conclusion with Steel ready to hit a Powerbomb, Ethan managed to roll out to nearly get a roll up on Steel, but Lucas was wise to this as he eventually hit the Jackknife Powerbomb to get the three count in an impressive debut. After the match Steel tried to continue the beat down on Ethan, but Ethan was thankfully saved by his team mate Luke Jacobs to end any more suffering for him. 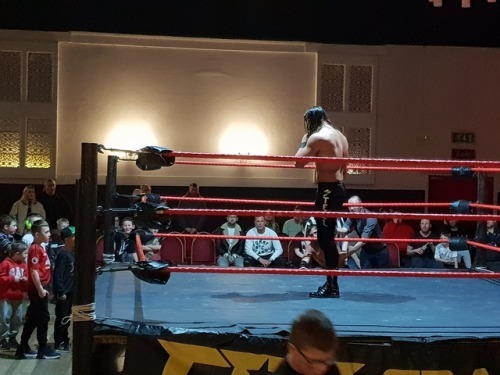 In closing, this was an excellent 5/6 minute match that was a competitive squash match that got both wrestlers over in an instance with the crowd – Steel especially who as we would see later in the show looks to be the main antagonistic heel as GPW goes through 2019. Another British Title qualifier next with Chase Alexander taking on our favourite Sandy Beach fresh from his victory in the Crazy Cruiser 8 tournament. The reaction to Sandy is still not letting up in Hindley, the Baby Shark chants, maybe but there is still enough sustained support for Sandy who this blog has been blowing the horn about for ages. 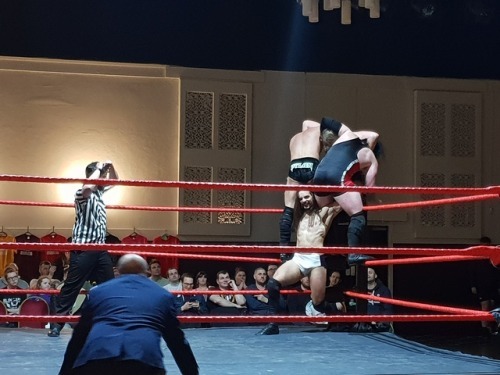 As per the earlier qualifier, this was another good match with Chase looking impressive and also impressing my mates Ben and Chris who remembered him from 5/6 years ago in Coventry for Triple X Wrestling when he wasn’t the finished article. 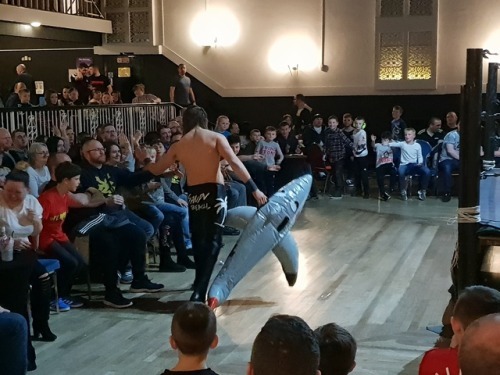 Chase certainly nearly looked like the finished article here as he swatted away the Inflatable shark from Sandy and slammed him to the mat. With Sandy looking like he was on his way to defeat, as Chase had him in position for a Berry Bomb which he hit for a 2 count, luckily though for Sandy he managed to regain his marbles to hit a Jumping DDT to Chase to get the win in around 10 minutes – Good contest! After the match Chase offered Taonga who had been doing the honours of the raffle the opportunity to be hit valet, but this brought out Dirk Feelgood and Melanie Price of Feel Good Media LTD (FML), leading to a beat down of Taonga and what looks like the addition of Chase into FML. Main Event time next with a huge 6-person tag team match with the Champions on one side in the form of Joey Hayes, Lana & L.A Austin taking on the contenders T-Bone & Craig Kollins and Soner Dursun with the latter hoping that if they got the win this would lead to title shots in their respective divisions in the future. As expected this was an all-action tag match from the start with both teams looking impressive along the way including picture perfect dives from both the Austins with Lana hitting a dive reminiscent of an Eagle. In the ring with the action reaching fever pitch, everyone were hitting their moves ending with T-Bone hitting a Superkick to Joey to leave a scene of bodies on the mat. It would be Hayes though who would eventually recover to end the match as he locked in the Cross Hayes to Kollins to get the Submission victory in just over 15 minutes to send the crowd home happy or so we thought. Out came Lucas Steel who attacked Hayes from behind, to stake his claim at the March 29th show for a GPW Heavyweight Championship match and I for one can easily see him beating Joey to wrest the title away from Leigh’s favourite son. Show done, we had enough time to visit the Edington Arms for this month’s Karaoke hopefuls and once again it was the man with his take on ‘Reet Petite’ stealing the show – check Ben Corrigan’s twitter for the full video!. I hope you have all enjoyed reading this review of GPW, give it the usual Likes and Retweets and I will see you next time – BYE!